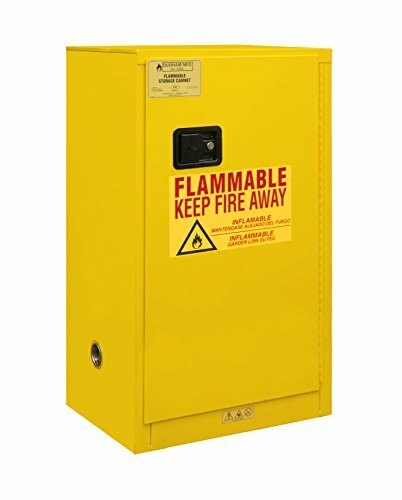 Durham Flammable safety cabinets are made of sturdy all welded 16 gauge double wall steel. 2-Inches wide louvers support shelves, adjustable on 4-inches centers. 2-Inches deep leak proof base. Safely contains hazardous chemicals reducing the risk of fire. IMPROVED security with recessed lockable Paddle latch and 3 point locking system. Bunged air vents on each side of the cabinet allows for ventilation. Safety yellow powder coat finish. Measures inches Length by inches width by inches height.